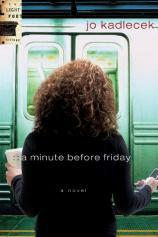 A MINUTE BEFORE FRIDAY is the third book in Jo Kadlecek’s Lightfoot Trilogy, which walks the career path of Jonna Lightfoot MacLaughlin, a religion reporter --- first in Denver (Book 1: A MILE FROM SUNDAY), then in New Orleans (Book 2: A QUARTER AFTER TUESDAY). Now she works for the fictional New York Clarion newspaper, having been recruited there by her former Denver boss, who has moved onward and upward to the Big Apple. Although we’re now in a new city, we’ve already met some of the story’s characters, such as Skip Gravely, that past and present editor who assigns stories to Jonna; Hannah, a political reporter and Jonna’s Harlem roommate who used to be a colleague in Denver; and Luke, the third of Jonna’s brothers (named Matt, Mark and Luke, for the three Gospel writers), who lives in nearby Hoboken, New Jersey, and maintains the trilogy’s thread to the extended MacLaughlin family. And then there’s Mr. Nice Guy, David Rockley, an archivist at Regal University (and friend of brother Luke), whose attentions Jonna has rebuffed since Book 1. News editor Skip Gravely, spurred on by a new and mysterious marketing man, wants Jonna to focus her attentions on a Wiccan story: one bitterly cold February morning rally at Regal University, then another at City Hall, meant to draw attention to the injustice of the Department of Veterans Affairs disallowing Wiccan symbols on headstones in military cemeteries. But Jonna, nudged by archivist David, becomes drawn into an injustice at the fictional Ivy League university on the Upper East Side involving misappropriation of endowment funds that had been earmarked for Christian studies and community outreach. Are there links between the stories? Who’s trying to hide what? Is the endowment issue even a story worth pursuing? This is the setup for the Clarion newsroom tensions. A reader who hasn’t opened the first two books will have no trouble jumping into the scene. But there’s more going on than the tracking of Jonna’s career. Book 1 might have been classified as a mystery; not so with this third installment, which feels more like a romance in front of a backdrop of the bustling New York City --- the subways, the deli-coffee shops (bodegas) on virtually every block, the impressive St. John’s Cathedral. And something about that New York setting leads Jonna to face her own personal spiritual story, drawing her to the Rock of Ages as a refuge in the chaotic and cold storm.